I had a wonderful revelation this morning. I was looking through catalogues and websites and finally realized something about a tumbler I own. 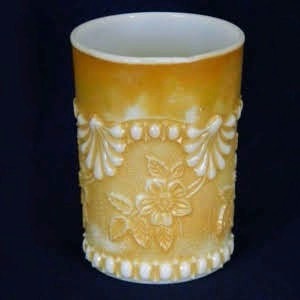 In Gorham’s Riverside Glass Works book, this pattern is shown as a pattern called Florentine. 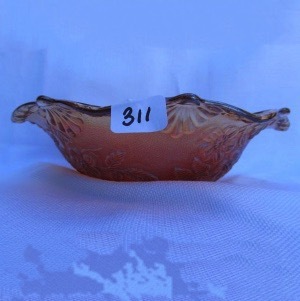 According to the book, the pattern was produced in 1906 and was made in a variety of shapes including a table set, water set, syrup, berry set, and relish tray. 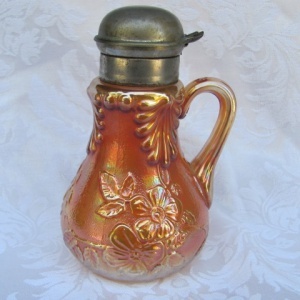 Among the colors/finishes are crystal with decoration, opal or milk, as well as light green and marigold iridescent.